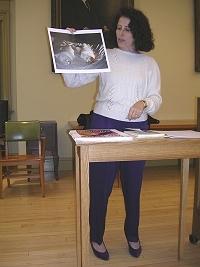 Lesléa shows students a photo of her cats. Lesléa Newman loves to visit schools, libraries, community centers, and writing conferences to talk about books and writing. She offers several programs to readers and writers of all ages and is happy to travel near and far to meet you! For information about schedules and fees for in-person presentations, please contact Lesléa directly by email or by phone at 413-552-3865. Learn about programs for elementary and middle school children and for teens and adults. Read what others have to say, and see a list of places where Lesléa has presented in the past.